HARLYM YEO: PC World: 20 Features WINDOWS Should Have... and hot to get them! 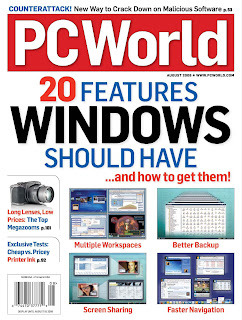 PC World: 20 Features WINDOWS Should Have... and hot to get them! 2) Cheap Ink: Will It Cost You? 3) Streaming Tools for HDTV - get high-def content from the Net and your PC with these devices. If you are keen to know more on the above, get your download link here for a free copy of PC World magazine.